The Board of Supervisors Finance Committee is planning to provide its preliminary fiscal guidance recommendation for next year's budget at its September 9 meeting. The guidance should then be voted on by the full board at its September 17 meeting. As you return to school, take a minute to let the Board of Supervisors know what you're looking for in school funding for next year. Here are some preliminary estimates of costs and items that we'll be looking at for next year's budget. Start a new elementary school foreign language program ? Provide necessary English Language Learner staffing ? Looking at these preliminary numbers of items we already know our schools need, it would cost around $90 million in new school funding. Don't get a response? Try one of their aides. Let's make sure the Board of Supervisors is thinking of our schools right now, since we all are. School Begins Tuesday, September 2nd from LCPS-TV on Vimeo. This Leesburg Today editorial gets it wrong. There are cuts that hopefully can be avoided, but not by spreading the salary scale fix for our teachers and principals over 2-3 years. The School Board's budget includes a 3.9% average raise for employees. The County budget includes a 3% average raise ALONG with a 1.5% raise for those at the lowest and highest pay grades for county employees. Spreading the salary fix over 2-3 years after 5 years of no step increase and raises that haven't covered inflation and rises in healthcare premiums is flat out wrong and Leesburg Today's editors should know better. Closing small schools is not punitive to the Board of Supervisors. It hurts the kids, parents, and employees of those schools. Just like ending bussing to TJ hurts those kids and parents and bus drivers. And ending summer school hurts kids who need it to keep up. Or not funding needed Special Education experts like school psychologists and occupational therapists hurts those parents and their kids who rely on those services. It goes on and on. The glaring area where the School Board needs to do better is get a formal staff recommendation on how they would close the $38 million gap. Surely they know the areas of spending best. Thanks to your support of our schools by reading these updates. 3) Commit to fighting for needed investment for our schools in next year's budget, the last before all members of both boards face election. Email info@sosloudoun.org if you'd like to attend an upcoming meeting of our group to organize that effort. April 23 special work session to continue budget discussion and possible adoption. The School Board held its regular meeting last night with budget reconciliation on the agenda. They are required to cut $38 million from their adopted budget request due to underfunding from the Board of Supervisors. In reverse order, here's a recap of the night. Proposed replacing all English Limited Learners (ELL) teacher assistants with ELL teachers to save $3.1 million. This was a plan that LCPS had been implementing through attrition (not replacing TAs and instead hiring teachers) but this would mean that the TAs would lose their positions now. Proposed capping the pay of long-term substitutes at $160/day to save $1.4 million. This keeps LCPS substitute pay competitive with surrounding counties. With the changes, the School Board had again covered the $38 million gap in funding from their proposed budget and the Board of Supervisors allocation. They will continue their discussions at a special work session tonight. LCPS Superintendent Hatrick took a "point of privilege" following the public comment because he wanted the public to know that the proposed cuts are a result of the artificial crisis created by the Board of Supervisors and the School Board is not responsible. He said he was not defending the School Board and people who follow things closely know there is much they don't agree on. But he agrees with them on their adopted budget request. He said that the Board of Supervisors "willfully chose not to listen to the public or the school board about the funding that is needed for this school system." He wants you to understand what happened and hold the Board of Supervisors accountable. He got a round of applause. During the public input portion of the meeting, it was clear that some segments of the public had heard about the cuts the School Board has been proposing thus far. There were close to 50 speakers in all and there were many people in attendance who did not speak but showed their support for the speakers. The largest group was Loudoun County parents whose kids go to TJ HS along with several local TJ students. One of the proposed cuts is to stop providing buses to TJ through LCPS in order to save $390,000. The School Board believes that they are under a legal requirement to either provide free transportation or none -- they cannot legally charge fees for transportation to and from school. When the cut was proposed, there was a suggestion of asking staff to help facilitate car pools or a private bus service with TJ parents. Half of the current LCPS Family Life Education Specialists spoke as well. There is a proposed cut to eliminate their positions and instead have PE teachers, who are certified to teach FLE, replace them in that area in order to save $1,417,400. The FLE Specialists made a point that Loudoun's FLE program is very successful and should not be changed. Several librarians and their assistants asked to look hard at the proposed reduction of library assistants from full to half-time to save $874,650. Many have a heavy workload already and feel this would greatly reduce services to students and teachers. School Board chair Eric Hornberger (Ashburn) mentioned in the later discussion that he is looking at a way to scale technology and library assistants to the enrollment of the school instead of a flat number per school (1 or 0.5), but doesn't have a proposal yet. A few speakers spoke in hopes of saving small schools, middle school deans, assistant athletic directors, math facilitators, or freshman sports. One speaker presented the results of the "Don't Touch It" portion of the SOS Loudoun survey and asked the School Board to support those priorities: fixing the salary scale, reducing elementary class sizes, improving technology (especially bandwidth and computers), and expanding full-day kindergarten. Once you've signed it, please share it with your friends. To sign up to speak at the public hearing tonight on the budget cuts, call (571) 252-1020 in advance or register in person before the meeting starts. The meeting and the public input begins at 6:30pm at the School Administration building in Ashburn. Six months ago, Support Our Schools - Loudoun was formed after the Board of Supervisors first announced its intention to set the tax rate at the equalized rate or lower. We started by getting informed on the budget process in October and asked the Board of Supervisors to advertise a tax rate that would give the Board flexibility to invest more in our schools. Then the LCPS staff proposed its budget, and we lobbied the School Board to pass many of the needed improvements through. Both efforts were successful, and we gathered even more supporters to lobby the Board of Supervisors to fully fund the proposed School Board budget. That effort failed. Now, we are left to help the School Board decide where to cut $38 million from the budget we fought so hard for. It's difficult for us and for them. There are no easy cuts. Everything affects somebody. Still, at the public hearings for both boards, there were themes heard over and over: raise teachers salaries, expand full day kindergarten to more schools, improve bandwidth at all schools, and reduce elementary school class sizes. Remind them of our priorities. Make sure to let your School Board members know what they are whether the items are currently on the proposed cut list or not. If you don't want them cutting something that's not on the cut list, still let them know that. If you don't want them cutting something that is on the cut list, it'd be a great help to let them know a new item not on the list you'd cut instead. The School Board will continue their budget reconciliation discussion on Tuesday, April 8 at the regular School Board meeting. Public input is accepted at that meeting. Additionally, a public hearing and work session is scheduled for Wednesday, April 9 as needed. If additional meetings are needed after that, they will be scheduled at a later date. Both meetings are at 6:30pm at the School Admin building in Ashburn. To sign up to speak either night, call (571) 252-1020 in advance or register at the door prior to 6:30pm. You can also reach your School Board members by phone or email and some on Facebook. School Board member Tom Reed represents everyone, otherwise they each represent their voting district. 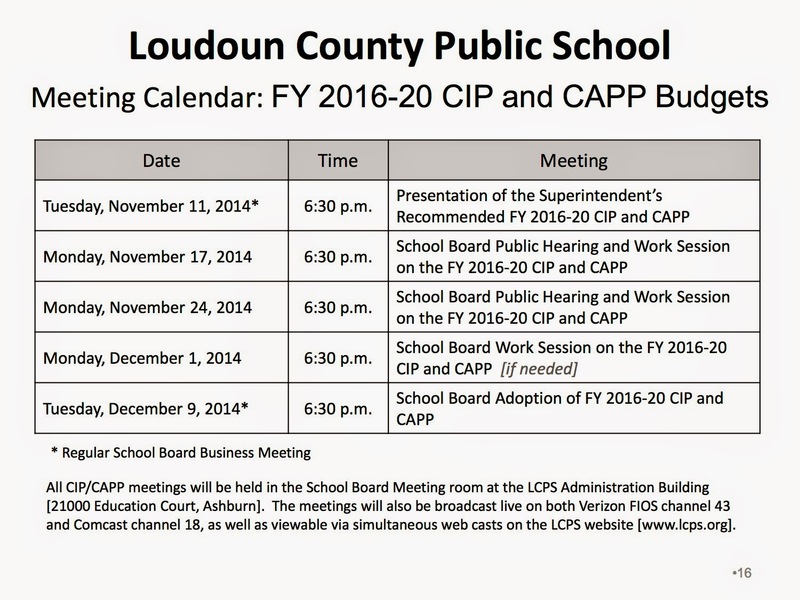 If emailing, you may want to also cc the whole School Board at lcsb@lcps.org.